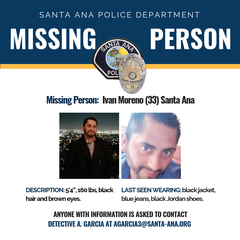 Ivan Moreno was last seen on January 23, 2019 at roughly 1 P.M., just before leaving to work at “Pit Fire Pizza” in Los Angeles. He typically uses the MetroLink train or Uber/Lyft for transportation. Moreno does not have a gang lifestyle but is known to use cocaine. His cell phone is currently turned off and all banking-related activity ceased the date he was last seen. Family members have not seen or heard from him. He does not own a vehicle. Anyone with information is asked to please contact Detective A. Garcia at agarcia3@santa-ana.org.